SPRING INTO A NEW FRENCH ACCENT! SAVE 30% THROUGH APRIL 1st! VALENTINES DAY SALE! SAVE 30% THROUGH FEB 20th! Joyeux Noël! My Gift to you, a Better French Accent! "This course is SO brilliant! I am savoring every lesson, learning those subtleties that I have, for so long, tried to understand! Phonetics and open syllabication— what a huge difference this is making, already. Merci mille fois!!!" "Thank you for this! Finally! I can do it! Watched so many videos about French R with thousands to million views but i still couldn't get it. This is the only video that helped me!" Her brilliant course of 8 video and audio lessons is not only the best instruction of French pronunciation techniques I've ever found - it is the only one. I cannot recommend her course highly enough." "I’ve been struggling with the French R for about 7 years and I can do it in 4 minutes after I watched this video! Thank you so much"
SPEAK FRENCH WITH CONFIDENCE! SAVE BIG THROUGH JANUARY 1st! 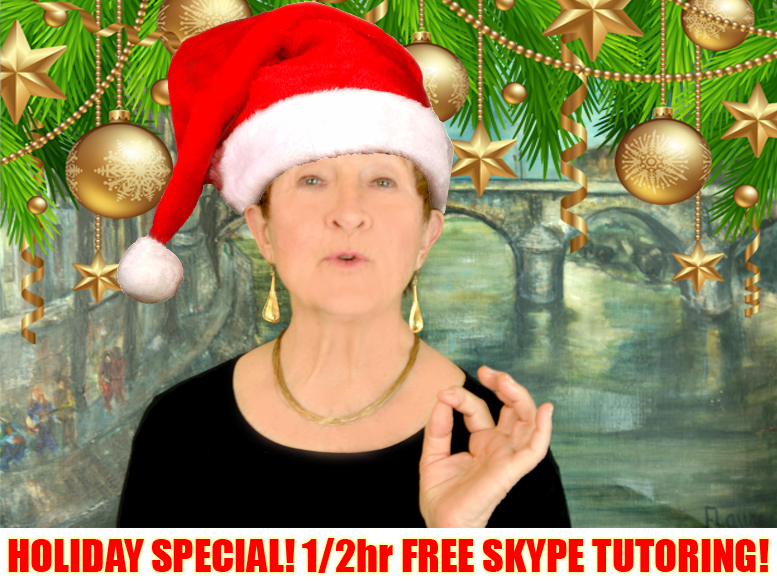 As my gift to the world of French speakers, I am happy to offer my online video course for the special price of only $99. This offer is good through January 1st and as always I offer a 30 day unconditional money back guarantee! 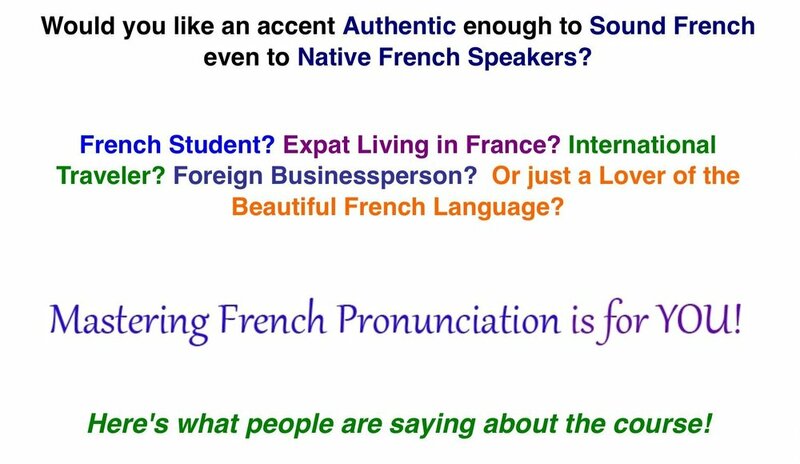 Would you like an accent Authentic enough to fool Native French Speakers? French Student? 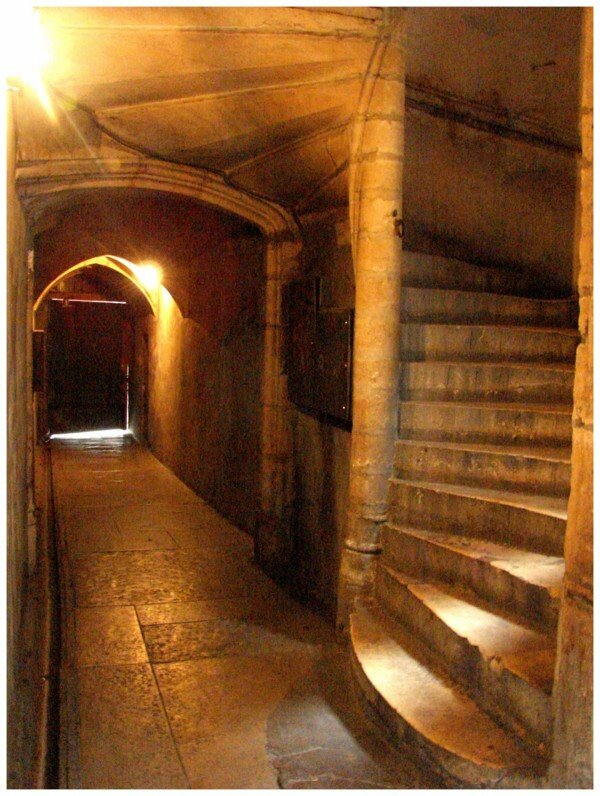 Expat Living in France? International Traveler?Foreign Businessperson? Or just a Lover of the Beautiful French Language? 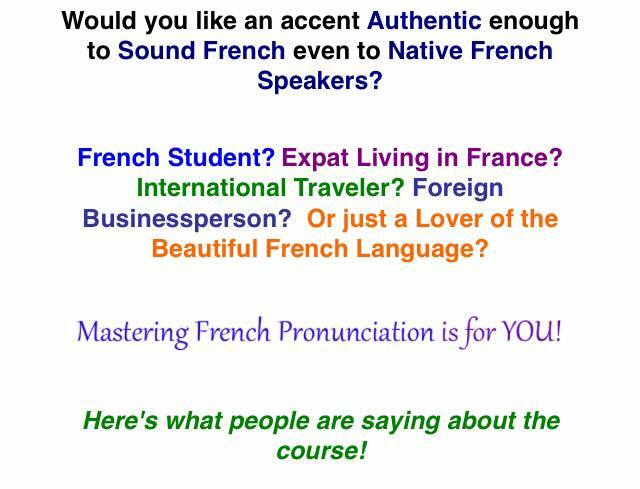 MASTERING FRENCH PRONUNCIATION IS FOR YOU! Here's what people are saying about the course! 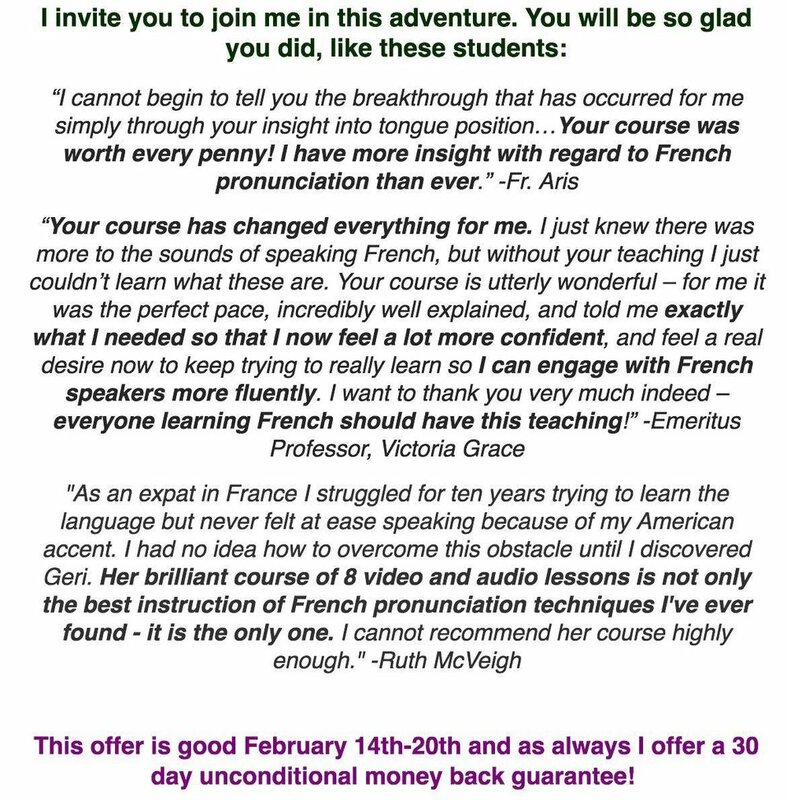 "Her brilliant course of 8 video and audio lessons is not only the best instruction of French pronunciation techniques I've ever found - it is the only one. I cannot recommend her course highly enough."